These Farm Heroes level 14 cheats and tips will help you beat level 14 of Farm Heroes. The objective of Farm Heroes level 14 is to collect 35 yellow suns, 15 green apples, and 15 purple onions in 16 moves or less. Only the cropsies listed will help you pass the level objectives to continue on to stage 15. 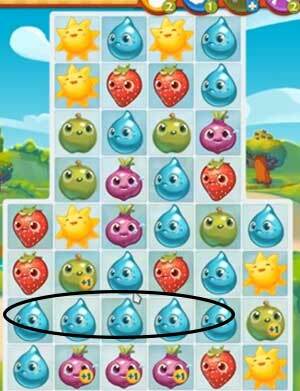 You have to collect 35 yellow suns, 15 green apples, and 15 purple onions, but there are also red strawberries and water droplets in this level. Feel free to combine other types of cropsies to add +1 bonuses to the board, but remember to collect the ones you need before you run out of turns! If you are going to make a combination with a cropsy that is not required to collect, make sure it is one of these two things: it is a 4 or 5 or L-shaped or T-shaped match, or it helps make one of those big matches with a required cropsy. This +1 booster as well as the magic shovel are the boosters that are the most valuable and the ones that you’ll probably use the most during your Farm Heroes Saga journey. 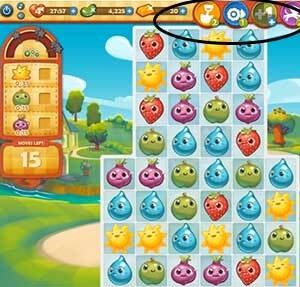 In Farm Heroes Saga level 14, if you create 4 chain, 5 chain, L-shaped or T-shaped cropsy combinations, they will sprinkle +1 boosters all over the rest of the board, most notably on your required cropsies. Use these to more efficiently rack up points on a level and meet your growth requirements faster. They add value to the cropsies, which means you can collect more at a time when you make matches with cropsies with plus boosters attached to them. Big combinations should be easy on a level like this with no obstacles. The board is wide open and you can get 5 matches horizontally and vertically, which is not always the case in Farm Heroes Saga levels. Keep your eyes open throughout this level, continuously looking for opportunities to add value to your required cropsies. Making a large match with a required cropsy next to other required cropsies to put plus boosters on them is the best case scenario. Level 14 is an easy level. Even though the boosters regenerate, you’ll have more of them available for a harder level if you save them now. Try not to use them unless you have to. If you decide to use a booster, use one that will still have some left. In Farm Heroes Saga Level 14, you shouldn’t have to use boosters. Start by making matches at the bottom of the board. This will induce new cropsies to drop into play and cause cascading matches, which are matches that the falling cropsies make with the existing cropsies already in place. These types of cascades can cause a lot of great, unforeseen matches and score huge points as well as add big boosters to your required cropsies. You could collect both the green apple and purple onion orders from just one series of cascades because of all the action that can take place from one nicely placed match in the bottom of the board.